- ALL chords come with different voicing. - 24 fretting keys to set and choose chords. - 24 picking keys to set and play chords. - Hit the chords with only ONE key or play their notes separately. - Transpose all the chords up or down at once. - Customize mapping for fretting and picking keys. Chord progressions and chords in general are a very important part in all genres of music, especially EDM. EDM having the most dynamic range of chords and elements than most genres. So we get that it is SUPER important to have a catchy and rhythmic chord set up. 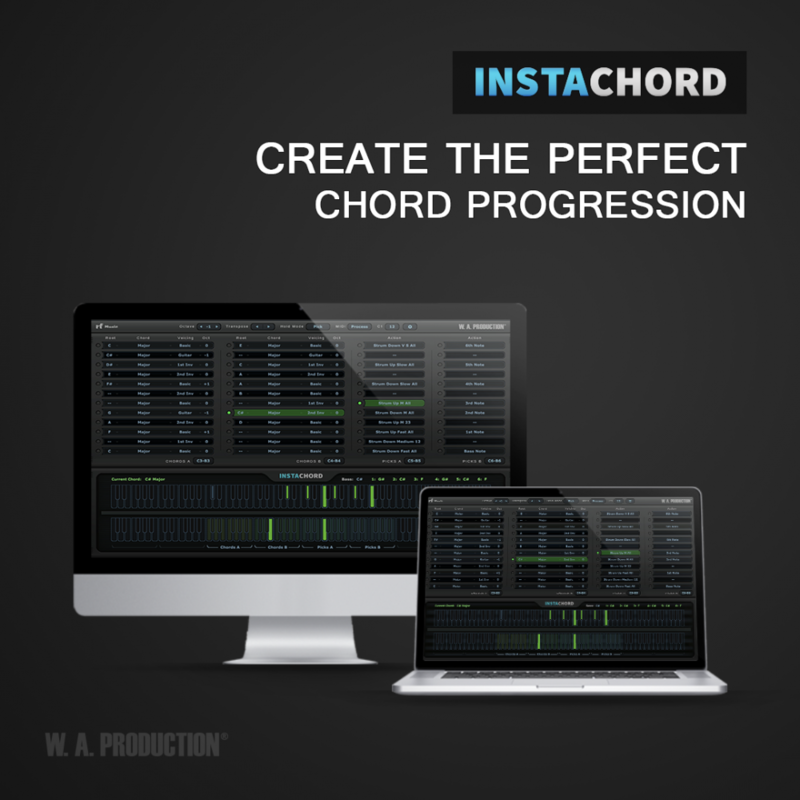 InstaChord adds a major ease to creating these catchy chords by basically doing it for you but allowing you to 100% customize how the chords are strummed, what notes are in the progression, velocity, and the octave you want it set it. Below are some of the features that InstaChord comes with with a few details on them. Though Chords on keyboards and guitars are voiced a bit differently due to the string tuning and their orders, InstaChord includes different chord voicing modes and at this current moment keyboard and guitar modes are available. InstaChord has this amazing ability that if the key of the track changes, you can use the transpose buttons to move all the chords up and down. Another amazing thing is you can also bypass the process if you need to play the target instrument in a normal way. InstaChord also comes with an amazing variety of Presets to choose from. InstaChord comes with this amazing Keyboard that is basically 2 different types of keyboards. We included this for a number of reasons, however the main one is because you need to know the difference between the note or notes you are actually playing on either you MIDI Keyboard or Computer Keyboard versus the Chords and Action that InstaChord is putting out via your customization. That's basically what the difference is, one section is the physical notes you are playing, the other is the Chord(s) and Action you set InstaChord to play. InstaChord is stocked with two sets of Chord sections, Chords A and Chords B. Both of these sections have 12 keys that allows you to change the Root Note, the Chord, Voicing and the Octave inside each key. This will be activated when that key is played. Both of the Chord Sections have different ranges, for example Chords A ranges from C3-B3, and Chord B ranges from C4-B4. - C: Chord Voicing. Here you can select a voicing mode for chords. These modes have the same notes but in slightly different orders. - E: Use the LED switch to select the chord by mouse. InstaChord is going to change the world of writing chords. The simple layout and detailed customization of each progression makes InstaChord a must have plugin. It will speed the process of your track writing up like crazy while still allowing you to add your creative flow. The sections Picks A and Picks B display keys from the selected octave (C5-B5 and C6-B6). The same for Chords A and Chords B, however in these sections you can select how you want the chords that you set in the Chords A and Chords B section to be played. You have choices like Strum Up or Down, Fast or Slow, Only Certain Notes etc. After you have this section adjusted to your favor, you can hit the Chords Key and the Pick Key and you will get the chord with the selected progression. - Hit: Plays all the notes of the chord at once. You can choose any combination of the 6 notes of the chord. - Strum: These actions will strum the chords up or down with different speeds and any combination of the six notes. - Bass: Plays the root note of the chord but one octave lower than the reset. - 1st, 6th Notes: These keys play individual notes of the chord. Depending on the voicing mode they may have different values but the first note is usually the root. You can see the notes on the keyboard and display panel. - Octave -/+: Use these keys to shift the octave up or down using MIDI notes. - Transpose -/+: Use these keys to transpose the chords up or down. - All Notes OFF: It does what it says, sends an off message for all of the notes. - Transpose: Use these buttons to shift all the chords up or down. This is extremely handy when you want to transpose the current chord progression to another key! - C1: Note names may vary from one host to another. For example, FL Studio names MIDI Note #0, C (0), and Logic Pro names it C(-2). Use this parameter to match the names on the plug-in with your DAW and eliminate the confusion. - Menu: You can SAVE or LOAD presets and access the "About Page". InstaChord comes with a crazy amount of presets already, so if you can create your own you have a ton to choose from. You can also switch to the "About Page" by clicking on the InstaChord Logo. - Output Keyboard and Display Panel: Here you can see the current chord and its notes. These notes are painted blue on the keyboard too, they turn green while playing. You can also use the mouse to play. And MANY more features that you can check out in InstaChord itself and its Manual. InstaChord can be used in DAW's (Digital Audio Workstation) like Ableton, FL Studio, Logic Pro X, Cubase and MORE! The team at W. A. Production are super excited to release this beast to the masses of beginner or professional producers all around the world. If we haven't convinced you enough, you can try InstaChord for free with our demo. But, we are fairly certain you will want to pick up this innovative and incredible MIDI Processing Plugin. Thank you to everyone who grabs a copy of InstaChord, we hope you enjoy and.